“Japan in Their Own Words” web page from the English-Speaking Union of Japan website. 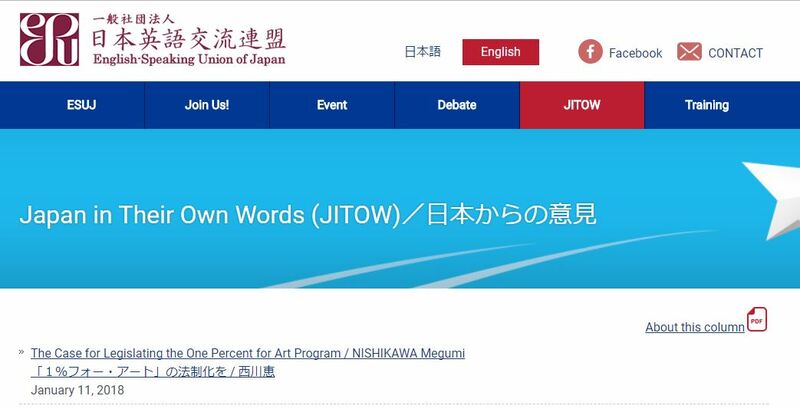 A column, “The Case for Legislating the One Percent For Art Program”, appeared on the English-Speaking Union of Japan website. Mr. Megumi Nishikawa, who wrote this column, is a Contributing Editor for the Mainichi Shimbun newspaper, a journalist and Executive Director of our association. The website’s “Japan in Their Own Words” forum aims to share a variety of opinions from within Japan with the world at large. At the same time, Japanese will be able to obtain and enjoy new ideas and perspectives from this forum.